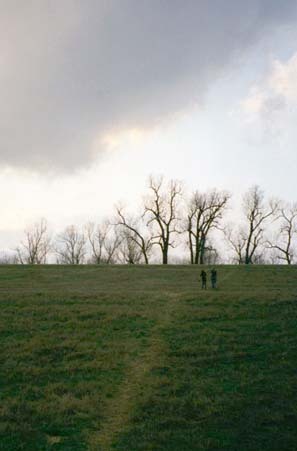 Doug and Alex running up to the top of the levee. This is the other side of the levee. As you can see, there's no water here. Turns out that in this particular spot, there's another levee further over by the river, keeping the water away from here. Signs down by those trees on the left said NO TRESPASSING, so we hailed a passing pickup (that's a dirt road along the top of the levee, and several cars and trucks passed by while we hung around) and asked where we might be able to see the river. The guy in the pickup was (again) very friendly, and he told us we could probably just go down through the posted area and find the river right there (he said we didn't need to worry about trespassing). 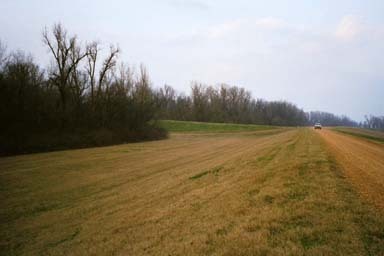 But he also told us of a spot a little further up, where we could drive all the way over the levee and get much closer to the river. We got further instructions from the guy in Hirsberg's, and away we went.